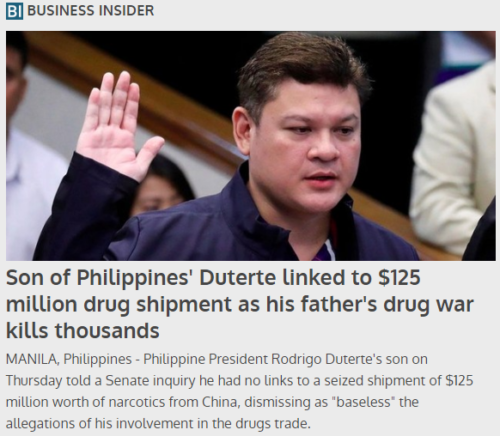 President Rodrigo Duterte, the mad rabid dog of the Philippines who is an admitted murderer who somehow became a leader of a nation of 103.3 million, has been waging a war on suspected substance abusers who use certain drugs, that has seen people by the thousands literally dragged into the street and extra-judicially murdered by law enforcement and vigilantes alike. Now Duarte’s son stands accused of being linked to a Chinese Meth shipment valued over $1 million dollars. Of course, being the son of the mass murdering President will probably prevent the younger Duarte from being dragged into the street and shot like so many of his father’s victims.